DC's leading legalization advocate reschedules 4/20 to protest Obama's inaction. While Obama has largely not interfered with marijuana legalization in states that have approved it, he has also signaled that he is not going to be proactive on the issue. A little more than a month ago, he said marijuana reform is not on his list  of end-of-term priorities, and his press spokesperson, Josh Earnest, paraphrased his position thusly: "'If you feel so strongly about it, and you believe there is so much public support for what it is that you're advocating, then why don't you pass legislation about it and we'll see what happens.'" 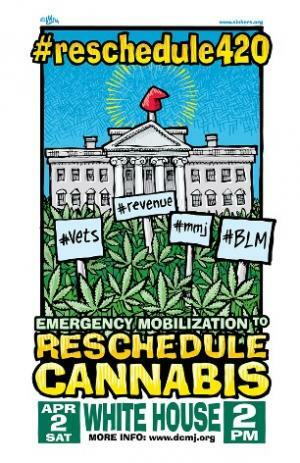 Led by indomitable DC activist Adam Eidinger, the man behind the District's successful marijuana legalization initiative in 2014, the DC Cannabis Campaign  is instead calling for supporters to gather in front of the White House to demand that Obama reschedule marijuana through executive action as he has the power to do , and that he pardon people jailed for marijuana crimes. Attendees will be encouraged to fire up in acts of civil disobedience. In an interview with US News and World Report , Eidinger predicted at least a thousand people would show up, and maybe many, many more. Eidinger said the DC Cannabis Campaign has polled its supporters on whether to organize the protest after Maher warned on his HBO show  legalization in the states is at risk as long as federal pot prohibition remains. Maher toked up on air as he issued his warning. Maher will be invited to attend the protest, Eidinger said. Obama, who has said he considers marijuana no more harmful  than alcohol, represents the best chance for rescheduling marijuana, and for emptying the prisons of pot offenders, Eidinger argued.